October is here! This year we decided that we wanted to several cocktail and snack pairings based off of horror movies. Since we did The Black Eyed Stickman: A Blair Witch Inspired Cocktail already, we figured we’d do a snack to pair with it. 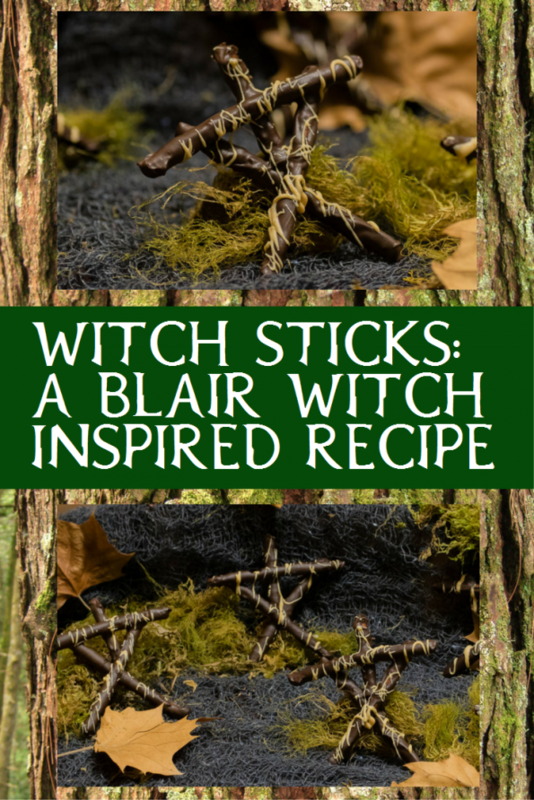 Thus, we present to you Witch Sticks! These chocolate peanut butter pretzels are the perfect combo of salty and sweet! This recipe isn’t hard to make but it is time consuming. Be sure to give yourself plenty of time to put these together. 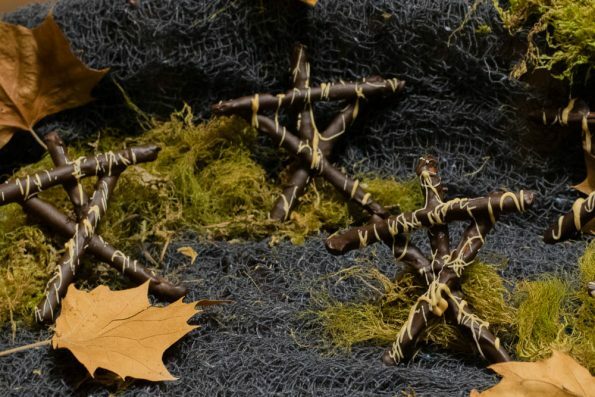 You can use any variation of melt-able chocolate to create Witch Stick. However, the peanut butter and dark chocolate create a look closer to the stickmen figures in The Blair Witch Project and Blair Witch. Melt chocolate wafers per package instructions. Break 5 of the pretzels in half. Dip pretzels individually in chocolate. Shake off excess. (You can touch up where you held the pretzel once on the wax paper. Start by creating a wide set X with the chocolate dipped pretzels on the wax paper. Take 1/2 pretzel and place in the top part of the X (this is the head). Make sure that the chocolate connects so when dry they will connected. Finish with a pretzel laid horizontally across the top 2 points of the X. This recipe can be increased as needed and one bag of melt-able chocolate will allow for more than 10 Witch Sticks. For reference, each Witch Stick Stickman is 3.5 pretzel sticks. *The Geeks attended a sneak preview of The Blair Witch and received promotional material in order to research theming for the cocktail mentioned in this blog but received no other compensation to facilitate this write-up; opinions are wholly our own. View our Disclosure Policy for more info. Yum! I am going to create these for an upcoming party! I love salt and sweet together- perfect! I have been serving witch sticks for years and never knew this. Changing the name right now. haha fun project idea – thank you! That’s a super rad thing to bring to a Halloween party!! They definitely look time consuming, but also so worth the effort! We love witch inspired anything. Very cool post! These look like perfect snacks to bring to a Halloween party. Thanks for posting! good idea for a kid’s party!